Flying to Phu Quoc Island is cheap and easy, but if you want a real adventure, riding there by motorbike from Saigon is much more fun. This road trip takes you from Vietnam’s biggest city to some its best beaches, via the waterways, highways, and back-roads of the country’s rice basket, the Mekong Delta. 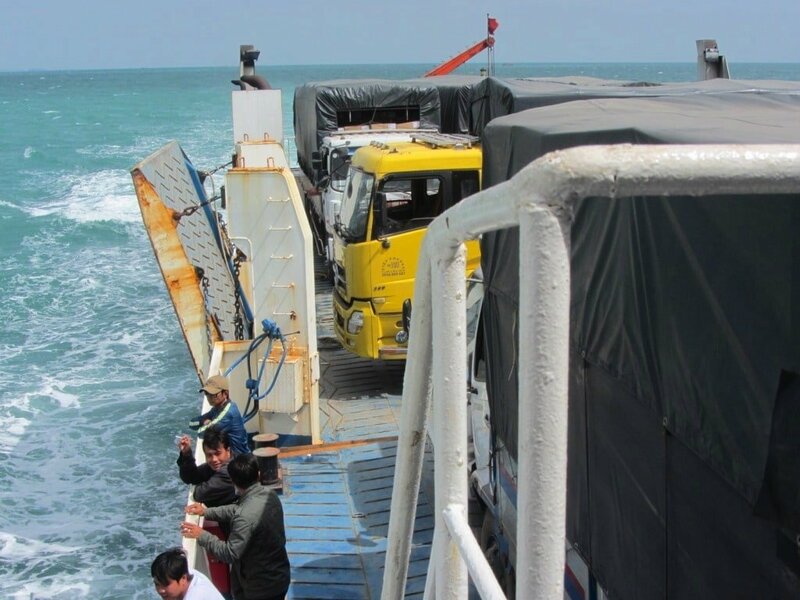 Upgraded roads – both on the mainland and on the island – and regular ferry connections from two Mekong Delta towns, make it possible to complete a motorbike loop from Saigon to Phu Quoc Island and back again. This round-trip, including four river crossings and two sea crossings, takes you through vast swathes of lush agricultural land, past bustling, commerce-driven riverside towns, through sleepy, off-the-grid villages along the Cambodian border, and across the sea to tropical island beaches lapped by the balmy waters of the Gulf of Thailand. I’ve written this guide in 3 sections: each section is long and detailed, and does not necessarily correspond to one day on the road. Click on a section from the Road Trip Contents above for full details of that part of the road trip. Phu Quoc, Vietnam’s largest island, is the southwestern-most point of the country: it’s closer to Cambodia than to the Vietnamese mainland. From Saigon to either of the ferry ports in the Mekong Delta (Ha Tien and Rach Gia) it’s a 300km ride west of the city. If you start early in the morning, you can make it in one day, but it’s more relaxing to spend two days riding through the Delta. In this guide I’ve included recommendations of places to stay and eat along the way, both in the Delta and on the island. I’ve written this route going anti-clockwise on the loop, but it’s also possible to do it in reverse. To get the most out of this ride, allow one week to complete the journey: this gives you time to explore the tropical beaches on Phu Quoc Island and to experience the bustling riverside towns of the Mekong Delta on the way there. The best time of year is December to March, when temperatures are hot but humidity is low, the sun is always out, and rainfall is rare. As always, leave Saigon early in the morning, well before dawn: before the fish arrive at the city’s wet markets; before the cauldrons of morning soup and baking bread scent the air; while the city’s party-goers are still out drinking and the streets smell of alcohol and seafood. 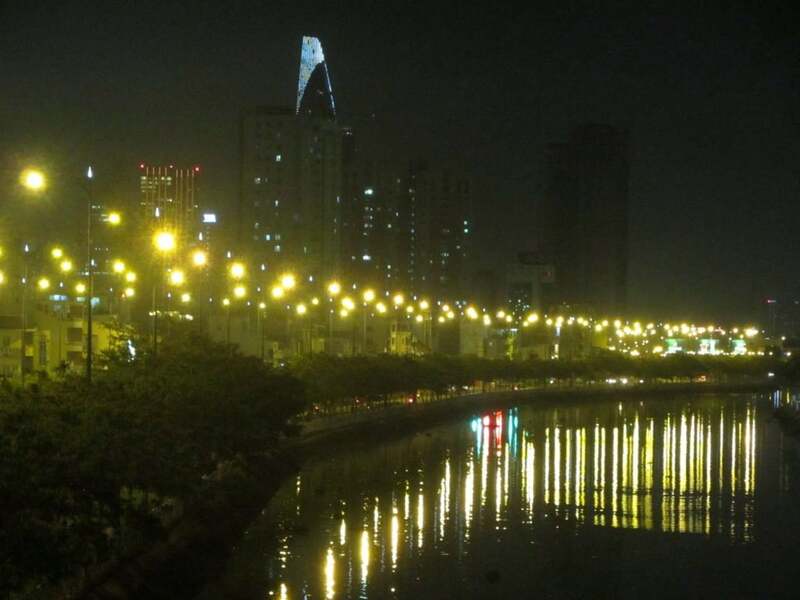 Saigon is beautiful, cool, and quiet at this time. Just as on the Midnight Motorbike Loop, the city is at its best during the small hours. But the main reason for leaving early, is to get out of the city and its industrial suburbs before the trucks, dust, and commuter traffic wake up and transform this first leg into a hellish journey. Leave Saigon early and it’ll pay off for the rest of the day’s ride. Aim to depart between 4:00-5:00am. 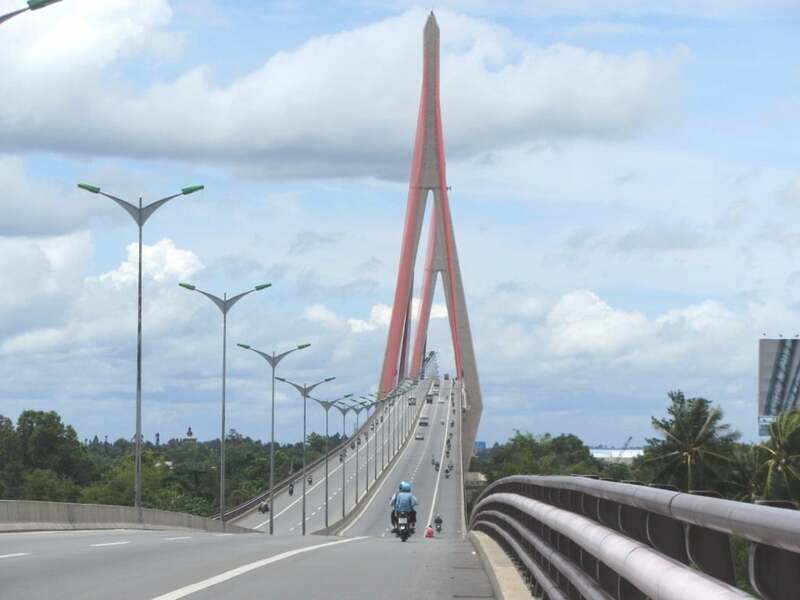 Take the Vo Van Kiet Expressway along the Ben Nghe Channel due west out of Saigon. The city is cool, calm, and even pretty, before dawn, with the lights reflected in the waterway by the road. Turn right on Ho Hoc Lam Street toward the end of Vo Van Kiet and join Highway QL1A due north for a mercifully short stint before bearing left (due west) on Road DT10 towards Duc Hoa. (Note: the turning off Highway QL1A onto DT10 is easy to miss: turn right just before the flyover on QL1A and then bear left under the flyover to get onto DT10.) This is a straight, dull road lined with cafes, shops and food stalls at first, then large industrial estates (including the GIVI factory) and lively wet markets which sprawl into the road, surrounded by dust and trucks, and shrouded in a chemical-infused fog. It can be an awful, traffic-clogged ride if you hit it at the wrong time of day so: leave early. At the end of Road DT10 turn left at the junction onto DT824 for a few minutes before bearing right on a short stretch of dirt road, which links up with Highway QL N2 heading due southwest to the Mekong Delta. (Again, the turning for the dirt road is easy to miss: look out for it just before Road DT824 turns southwards.) If you’ve timed your departure from Saigon correctly, the eye of dawn should be opening to the east by the time you hit the bridge across the Vam Co Dong River, with the sun rising behind tropical foliage, making silhouettes of the coconut palms lining the riverbank. Saigon and its suburbs are behind you and now the real road trip begins. After the long slog out of Saigon, it’s a relief to find yourself, very suddenly, in the lush, fertile, farmed, and watery world of the Mekong Delta. Road N2 ploughs straight and true across mile after mile of fruit plantations and fields – pineapple, papaya, jack fruit, coconut, sugarcane and, of course, rice – over Mekong tributaries and canals, past palm-thatched street stalls selling agricultural produce – jams, sauces, fruits, steamed corn. This is what the Mekong Delta is all about; the bounty of the rich alluvial soils: Welcome to the grocery basket of Vietnam. Road N2 is the southern extension of the Ho Chi Minh Road which will eventually continue even further south. Regular truck use has begun to take its toll on the road – it’s a fairly uneven, pockmarked surface at times – but in general the riding is good and easy. At Thanh Hoa, take a right after the bridge and pass through the large market before continuing along the canal to Tan Thanh. A likable little canalside town with cafes and snack shacks along the waterside promenade, Tan Thanh is a good place for a breakfast pit stop while watching the rice barges glide by. From Tan Thanh take Road DT829 west out of town, following a canal lined with banana plants. Under the clear blue sky and bright early sunshine of a dry season day, the colours on this section of road are electrifying. It’s fascinating to watch canal life from the road: wooden row boats – the water taxis of the Mekong – ferrying people and produce from home to home, and giant rice barges towering over the waterside brick-and-thatch houses as they make their serene, silent progress from field to factory. A couple of kilometres before reaching the end of DT829 there’s a very inviting-looking rest stop with hammocks swaying in the shade next to a lotus pond: take a break from riding and recharge for 10 minutes here with a cà phê đá (iced back coffee). Bear right onto Road DT844 and continue west towards the wetlands and forests of Tram Chim National Park. This is a dyke road raised a couple of metres above the fields so as not to get flooded during the rainy season. The landscape here is characterized by vast open spaces and empty skies: it’s enough to induce mild agoraphobia. 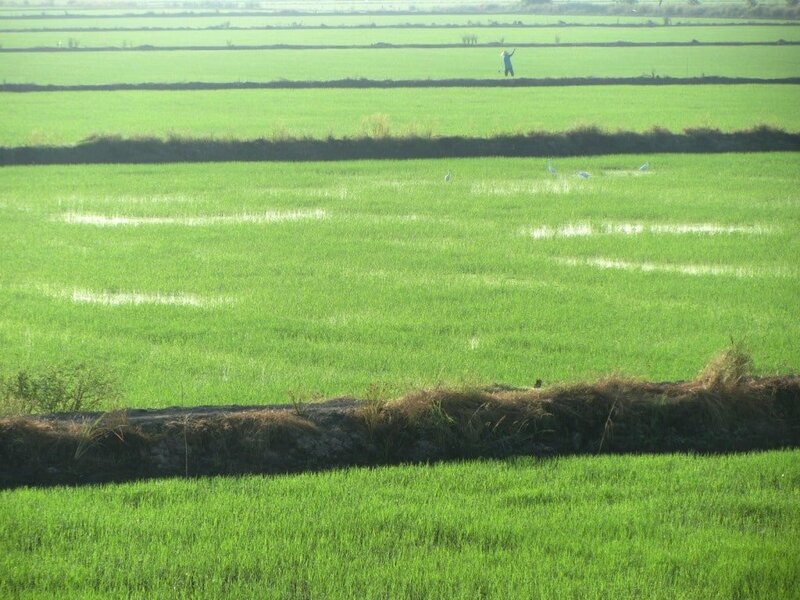 The fields stretching into the distance on either side of the dyke will either be green, flooded, or fallow depending on what stage the current harvest is at (there are sometimes as many as four rice harvests a year in this part of Vietnam). Eucalyptus and tamarind trees occasionally line the road while the skies are full of white egrets. This is a landscape that appears to be ever fertile, generous, rich and benevolent. But it wasn’t always that way. Before the colonial French began a draining, dredging and canal-building program in the Delta, much of this area was a swampy, uninhabitable no-mans-land. Before hitting Highway QL30, look out for the interesting-looking and highly decorated wooden homes along this road (which, I think, belong to the local ethnic Khmer population) – you’ll continue to see them all the way to Chau Doc. Turn right onto QL30 and follow the Mekong River north for an uninspiring and fairly bumpy 10km to the busy city of Hong Ngu. Close to the Cambodian border, Hong Ngu has all the qualities a Delta city should: a large bustling market, lots of street food, immense heat, and constant activity. If you’re tired of riding for the day or if you’re running out of daylight, this is a good, off-the-beaten-track place to spend the night. There are a handful of hotels and guesthouses (nhà nghỉ) here, including Mai Khanh Hotel, which offers good, clean rooms for $10 a night. For food, try the delicious rotisserie meats across from the market or sample any of the street food stalls in the area. Head due west out of Hong Ngu on Road DT841, which leads over a bridge (a good vantage point from which to view the floating homes and fish farms around Hong Ngu) to the ferry crossing to Tan Chau. As river crossings go, this is a nice, quiet and scenic boat ride over the wide, muddy waters of the Upper Mekong River. Arriving on the other side, turn right along the attractive riverfront promenade of Tan Chau. The Song Lac Riverside Hotel (199 Tran Hung Dao; 0763 596 789) is an appealing place to break the journey, and Tan Chau has a lot of off-the-beaten-path charm to it: stroll along the waterfront, explore the street food scene in the shady backstreets, and soak up the laid-back atmosphere of this unexpectedly pretty Mekong town. Make a left out of Tan Chau on Road DT953 heading southwest towards Chau Doc. A large Cham population live on this island between the two main branches of the Mekong River. The Cham were once a powerful kingdom, ruling most of what is now Central Vietnam. 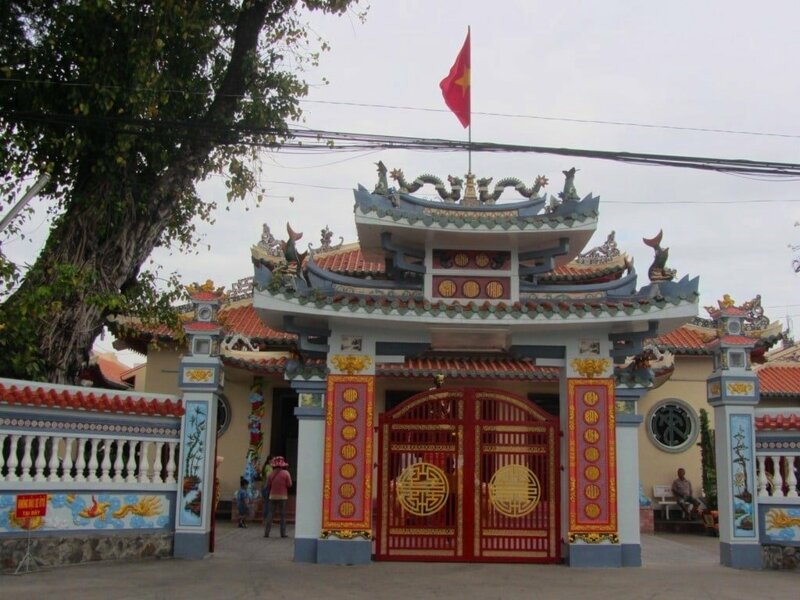 Originally Hindu, the Cham converted first to Buddhism and then, in the 17th century, to Islam. 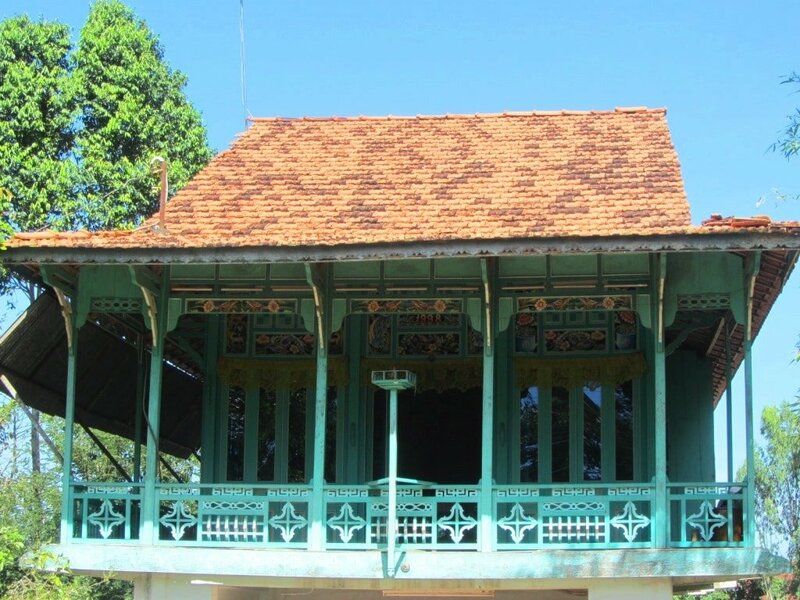 There are several ornate mosques on this route, from which the daily calls to prayer are answered by hundreds of Cham locals. Another feature of this short but interesting canal-side road, is the presence of wooden food carts. Pushed along the road by women in straw hats, they sell cooked food and raw produce to anyone who approaches them. It’s definitely worth stopping at one of the soup carts and trying the delicious noodles. 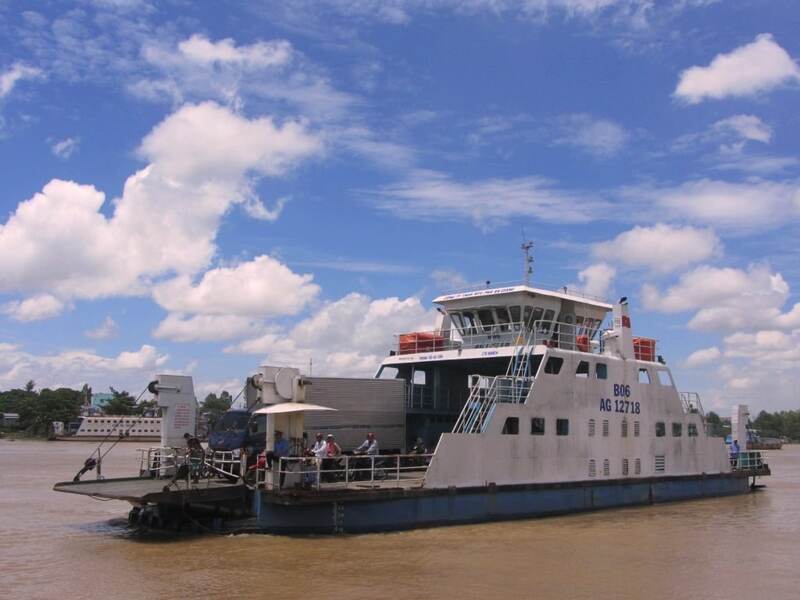 Another ferry at the end of Road DT953 takes you across the Lower Mekong River to the sprawling city of Chau Doc. With a good market and riverside location, Chau Doc is a scruffy but intriguing and energetic Delta town. If you need somewhere to stay for a night, Chau Doc has a good range of accommodation, because it’s a major transit point for travel between Vietnam and Cambodia. Murray Guesthouse is a superb outfit just out of town ($30), or if you want to splurge on some colonial charm, head to the riverside Victoria Chau Doc ($100). However, if you have plenty of daylight hours left, I recommend bypassing Chau Doc altogether by turning left off the ferry and taking a right onto Highway QL91 heading southwest towards the Cambodian border. West of Chau Doc you’ll see Nui Sam Mountain rising from the rice fields. At once a sacred site for pilgrims and a domestic tourist trap, it’s a relief to see some high-ground after 200km of flat delta landscape. Indeed, this corner of the Delta is dotted with several mountains, forming a mini range of forested hills along the Cambodian border. I call these the Mountains in the Mekong and this is by far the most scenic part of the entire Mekong Delta region. All of these mountains are considered sacred and are home to temples, pagodas and shrines. Just before hitting the Cambodia border gate, bear right off Highway QL91 and onto Huu Nghi Street leading to Tinh Bien border town. There are a couple of huge markets here which are well-worth rummaging through, and the food stalls serve up some fantastic Mekong dishes, including bún mắm (a pungent fish and aubergine-based soup) and hủ tiếu Nam Vang (Cambodian-style rice vermicelli noodle soup). At Tinh Bien join Road N1, which traces the Vietnam-Cambodia border for almost 100km southwest to Ha Tien on the Gulf of Thailand. Running alongside a canal, which essentially marks the border, this is a very pretty stretch of road. 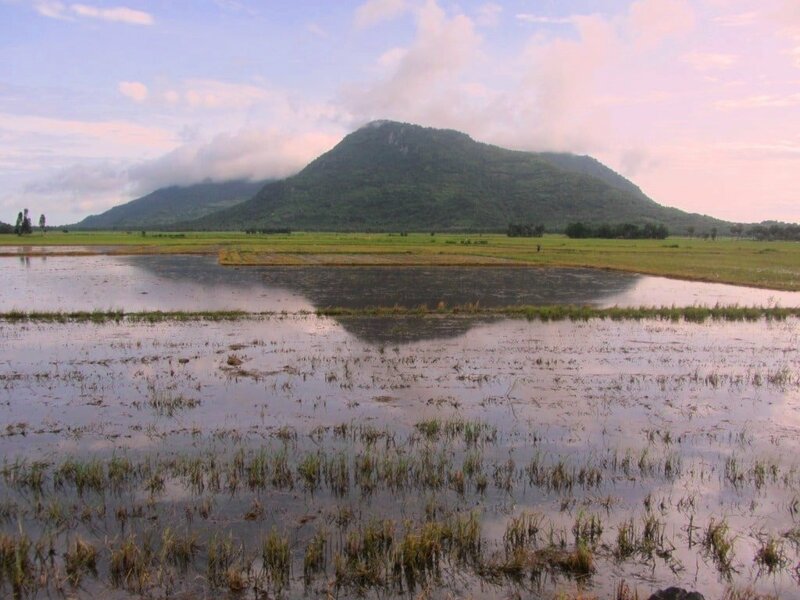 On the Cambodian side, a carpet of green rice fields stretches into the distance, where mysterious ‘foreign’ mountains rise in a heat haze on the horizon. On the canal, large rice barges come chugging downstream, kicking up waves for little wooden canoes to ride as they skim about on the muddy surface, like water flies. Sugar palms, bamboo, eucalyptus and tamarind trees lean over the waterway in the soft afternoon light. The scene, populated by sleeping buffalo and working men and women, is quiet save for birdsong, the distant echo of sputtering boat engines, and the occasional passing motorbike. Colourful kingfishers sit on telegraph cables, and the scent of eucalyptus, blossoms, damp and heat fill the air. How could anything horrific happen in a place like this? But it did. In 1978, the Khmer Rouge came across the border and massacred over 3,000 men, women and children in the village of Ba Chuc, just south of Road N1. The events are recorded at the memorial here in horrifying detail. I do not wish to write about it again, so if you want more information about Ba Chuc please click here. After passing through a mangrove forest, Road N1 ends at the Gulf of Thailand, where it hits Highway QL80. Turn right and head west along a beautiful stretch of coast road to Ha Tien. 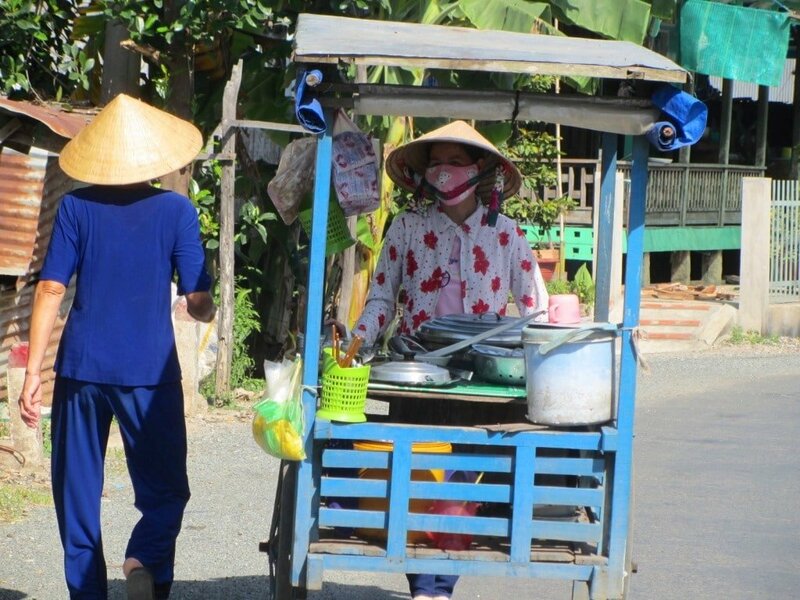 Compared to the general busyness of other Delta settlements, Ha Tien is a quiet, slow-paced town. 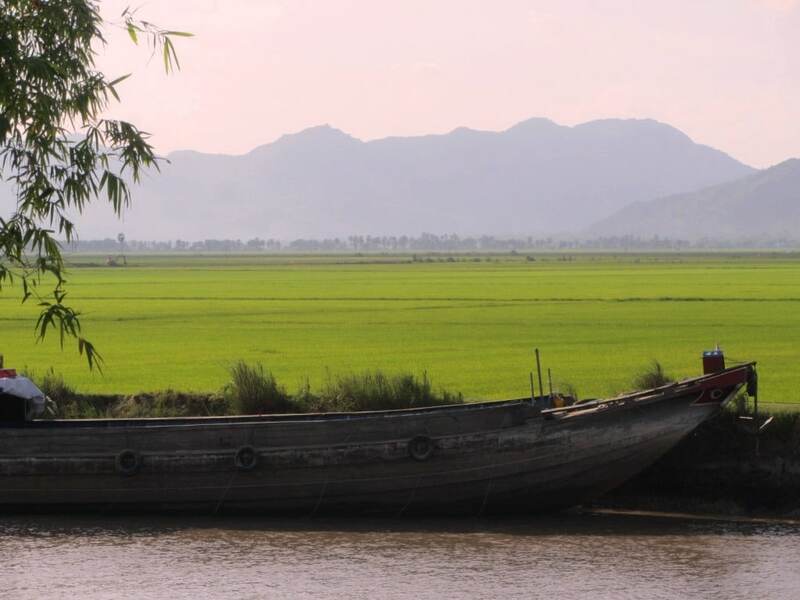 Lying on the north bank, at the mouth of the Giang Thanh River, in mainland Vietnam’s southwestern-most corner, and surrounded by small, forested limestone hills, Ha Tien is, in my opinion, the gem of the Mekong Delta. Ha Tien is located just a few kilometres from the Cambodian border and is fast becoming the main port for boats to Phu Quoc Island. 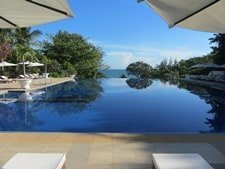 In the last few years Ha Tien has thrived as a transit point for travellers on the Southeast Asia beach trail: linking the up-and-coming beaches of Cambodia’s south coast with the increasingly developed beaches of Phu Quoc Island. But there’s still a sleepy grace to this town: crumbling colonial buildings and old shop fronts stand on its quiet, shady backstreets; birdsong fills the streets at dusk when cafes and seafood stalls set up their chairs along the riverfront promenade; in the early mornings the big fish market teems with activity as the fish are unloaded straight off the wooden boats, returning from a night at sea. 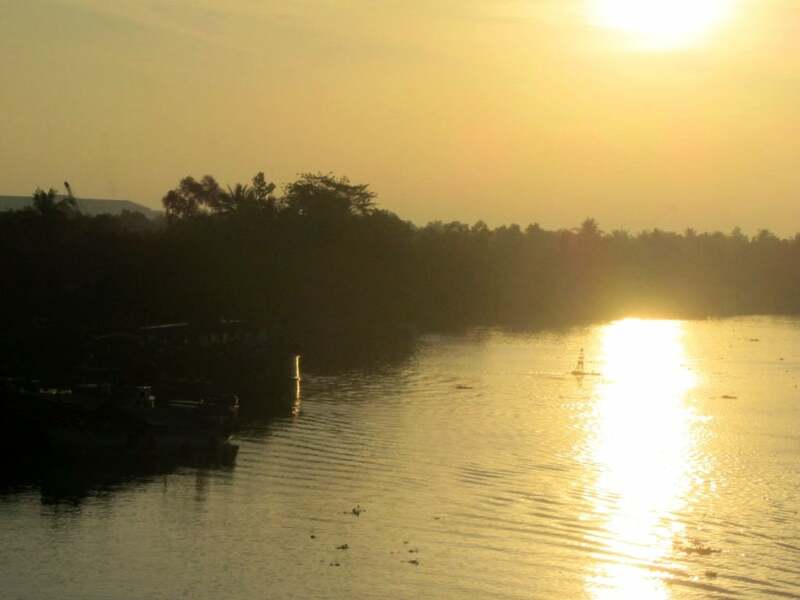 Ha Tien is charming in a way that few other Mekong Delta towns are. Food and accommodation is plentiful and good value, and boats to Phu Quoc Island (fast boats and car ferries) leave from Ha Tien ferry pier at least four times daily. Depending on how much time you have, I recommend spending at least two days in Ha Tien to soak up the lazy but attractive ambience of this border town, and recharge your batteries after the long drive through the Mekong from Saigon. There are dozens of mini-hotels and guesthouses clustered around the market, all of which sell boat tickets to Phu Quoc. Budget travellers should consider the rooms at Hai Yen Hotel (15 To Chau Street; 077 385 1580), Hai Phuong Hotel, and Du Hung Hotel, all offering clean, tidy and bright rooms near the waterfront for $10-$20 a night. Mid-range travellers can find excellent-value river-view rooms at the River Hotel for a very reasonable $40 a night. 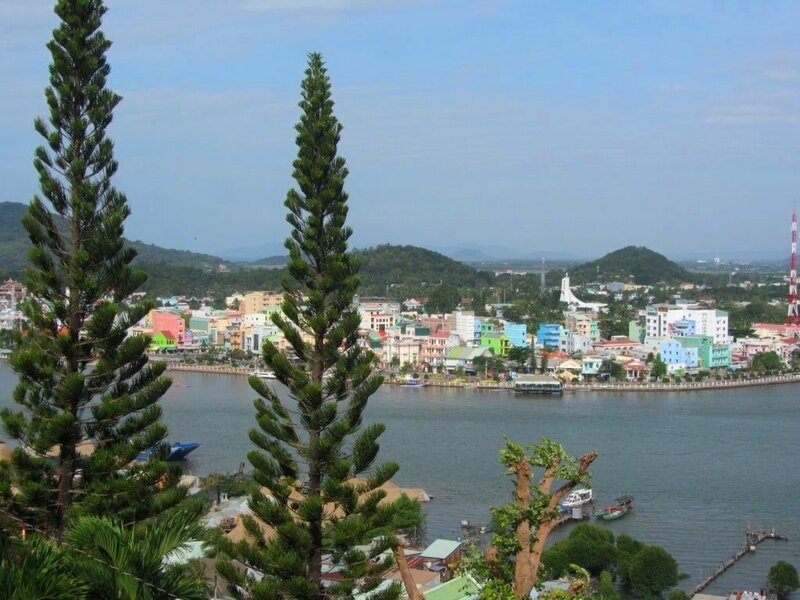 At all of the above hotels, make sure you ask for a room with a view and a balcony, because this is a great way to soak up the fabulous riparian location that Ha Tien enjoys. The main drag of Trần Hầu has plenty of shops, cafes, and restaurants. For good, cheap and easy point-and-order meals, head to Tiệm Cơm Anh Tuyết at 61 Trần Hầu: 20-40,000vnd ($2) a meal. 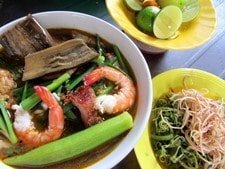 For a local bowl of soup try Quán Thúy, at 7 Trần Hầu. The owner has been serving miếng gà (chicken noodle soup) here for more than 20 years. She’s open from 3pm till late into the night: 35,000vnd ($1.50) a bowl. The night market is a good place to try all number of Vietnamese street food dishes, although, as sellers get more accustomed to foreign visitors, overcharging is more common. Try the bánh xèo (Vietnamese savoury pancake) behind the Bach Hoa Market. Oasis Bar (www.oasisbarhatien.com) is owned by UK expat, Andy, who is a good source of local information, and his all-day breakfasts and cocktails really hit the spot. Aside from this, don’t forget to venture into Ha Tien’s back-streets, away from the riverfront, where you’ll discover more local food and drink stalls: try the bún thịt nướng (cold noodle salad) outside the old house at N°49 at the intersection of Lam Son and Nguyen Than Hien streets [MAP]. Once you’ve had your fill of Ha Tien’s charms, take your motorbike aboard one of the several daily fast boats or car ferries to Phu Quoc Island. Booking tickets is easy and fairly cheap, and sailing time is anywhere between 1.5 to 3.5 hours, depending on which route and vessel you take. 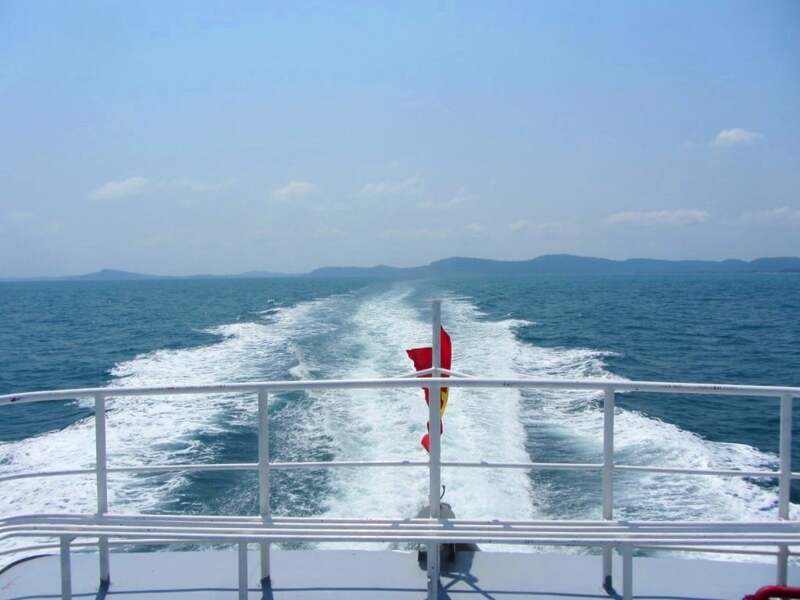 For full details, including ferry routes, schedules, and fares, see my Guide to the Phu Quoc Ferry. There’s always something exciting and romantic about arriving at a destination by boat; and arriving on Phu Quoc Island is even more thrilling, because you have your own wheels with you. Stand out on deck and watch the jungled ridges of the island loom larger and clearer as the boat nears the port. Then, ride straight off the boat and onto Vietnam’s largest tropical island. The recent completion of major infrastructure projects means that circumnavigating Phu Quoc Island on two wheels is now relatively easy. New paved roads have replaced (or, in some cases, are in the process of replacing) most of the old dirt roads, even to remote beaches. With the notable exceptions of the Ham Ninh-Bai Thom road and the Cua Can-Vung Bau road, almost all of the major beach roads are now sealed. You get an immediate impression of this as you ride down the ferry pier, away from the boats and the jellyfish-infested waters of Bai Vong Port, and weave through the traffic meeting the ferry on a brand new road. Join Road DT47 and head northwest. 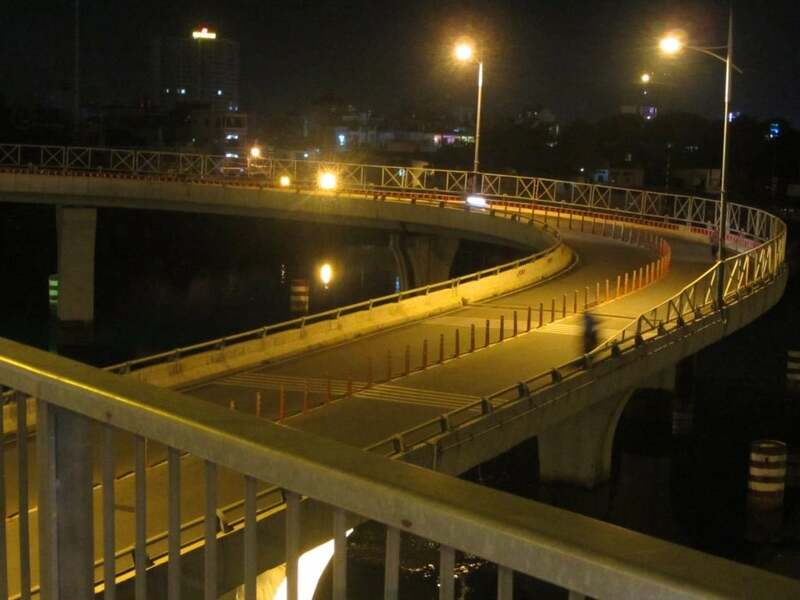 This wide new highway whisks you into Duong Dong Town within 20 minutes. Duong Dong, Phu Quoc’s main urban area, is where you can pick up the brilliant, free tourist map of the island, which is updated every year, including all the roads (and their current condition), places of interest, and gas stations. I usually get mine from Buddy Cafe, but they are also available in many shops, hotels, tourist offices, and stalls. Duong Dong is really two places: to the south, along the beach, is where all the resorts and tourists are: this is known as Long Beach; to the north and east, around the river, is where to real town is: where local people live and work. Long Beach is the main hub for accommodation, food and drink on the island. It’s a very beautiful stretch of palm-fringed sand and calm water, but it can get crowded during the high season (December to April) and on public holidays. Also, because nearly all the beachfront has been built on, there’s precious little public beach left for people who aren’t staying in beachfront accommodation: normal etiquette is to buy a drink at a resort if you want to use its beach. There are lots of places to stay in all price ranges on Long Beach. My pick for (reasonably) budget digs is La Mer Resort; for mid-range value Thanh Kieu Resort is fantastic; and for high-end, La Veranda is as posh as they come. For food and drink, the ever popular Night Market has recently relocated to the banks of the Duong Dong River on Bach Dang Street. It’s still as bustling as every and there’s plenty of seafood on offer, but it’s hard to get away from the feeling that this is essentially a ‘tourist market’. For something a bit more local try the excellent seafood at Ra Khởi (131 Đường 30/4) and Sông Xanh restaurants. The Saigonese Eatery is another excellent and exciting new addition to the Duong Dong eating scene. Buddy Cafe is always good for a coffee and ice cream, and the nights always last longest at Rory’s Bar. 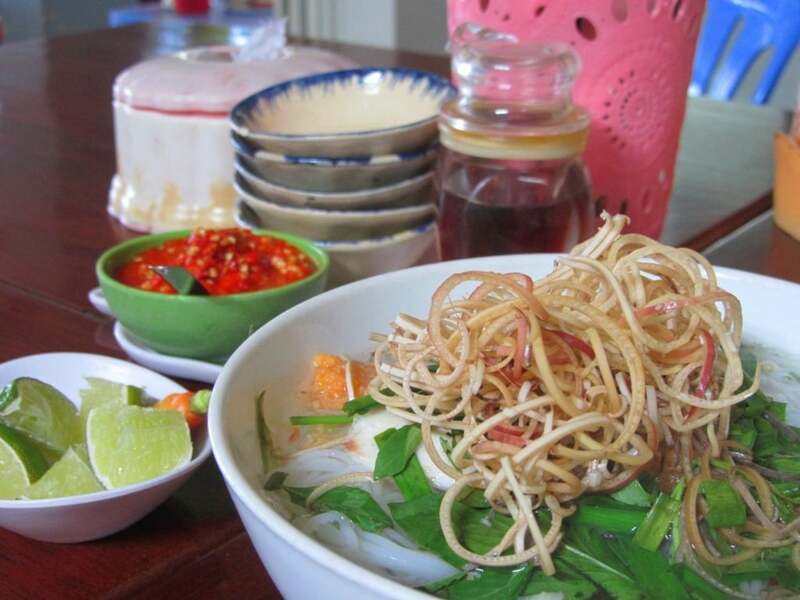 For a genuine Phu Quoc breakfast speciality, don’t miss bún kèn (seafood soup) at Mrs Luom’s. From Duong Dong town head south on Tran Hung Dao Street. Eventually all the resorts, bars and restaurants fade away. Until a few years ago, this road turned to red dust after it passed the turn off for the airport, and skirted kilometres of empty beach all the way down to the southern tip of the island. Now, however, developers have moved in and gigantic resorts, residences, shopping malls and the like are under construction. 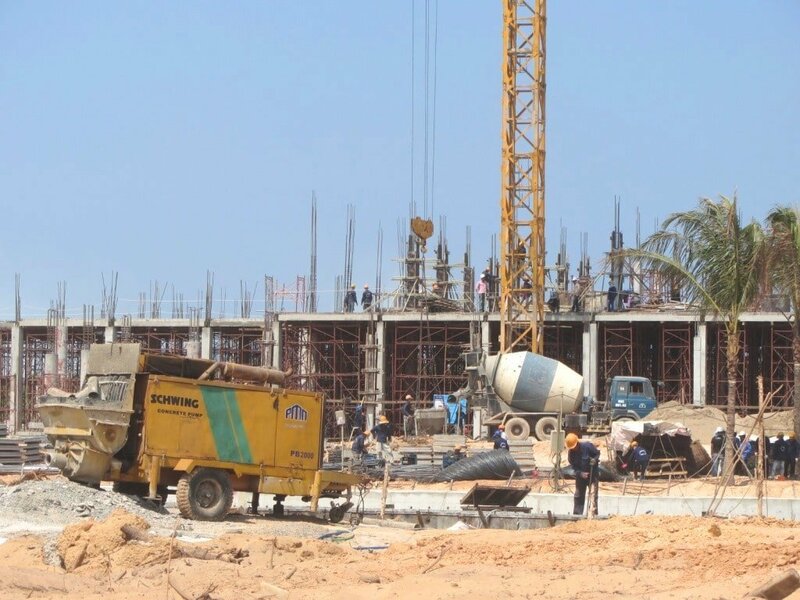 Although it’s still possible to ride Tran Hung Dao Street along the coast down to An Thoi, it’s not much fun with all the trucks kicking up dust and the cranes, bulldozers and construction debris littering the area. And pretty soon, once the construction has finished, this entire stretch of beach will only be accessible to guests or residents. However, in anticipation of this, a brand new, multi-lane highway has opened, running parallel to the coast but behind the developments, a few hundred metres from the beach. It’s not particularly scenic, but it’s a very quick way to get from Duong Dong to An Thoi, and there’s a certain sense of wonder and awe at seeing the scale of construction going on around the road. An Thoi is the southernmost tip of the island and Phu Quoc’s main port. It’s an interesting place but a bit of a mess at the moment due to construction, so unless you’re looking for a local lunch there’s not much reason to come here. Instead, follow the new highway until it finishes at Road DT46, opposite the entrance to the Marriott Emerald Bay. 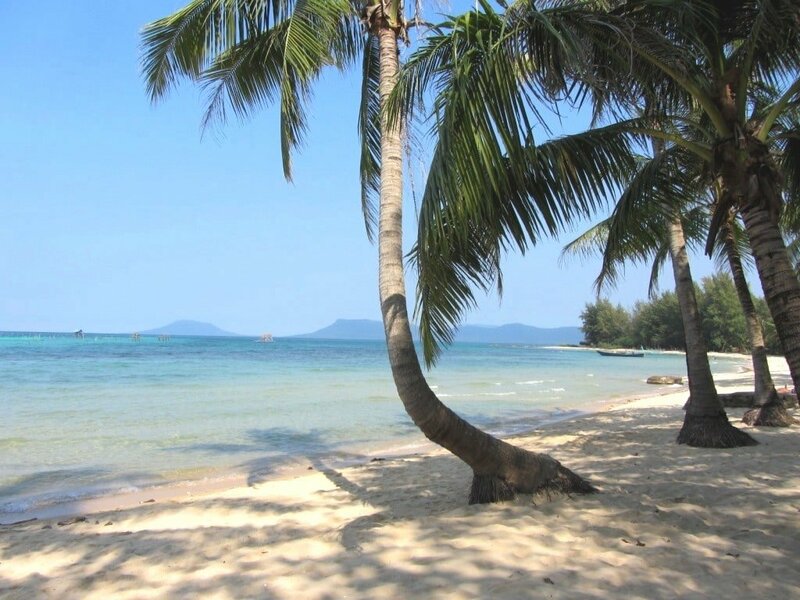 This new development has gobbled up another of the island’s best beaches, Bai Khem. You can still follow one of the lanes down to Khem Beach, but most of it is in the process of massive transformation. It’s a much better idea to continue north on DT46 for a couple of minutes before turning right (due east) onto the dirt lane leading to Bai Sao (Sao Beach). 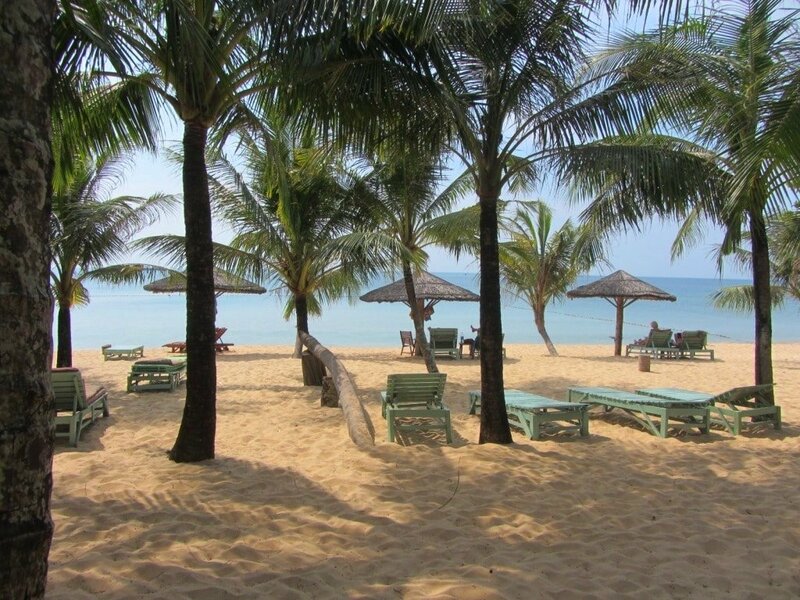 For years, Sao Beach has been regarded as one of Vietnam’s best beaches. The sand is as white and powdery as flour and the water as clear as gin. But Sao is also the most popular day trip destination on the island, so there are many more people on the beach these days. Still, there’s a good atmosphere here, and it’s one of the few places on the island where Vietnamese tourists outnumber foreign. You can stay the night here at My Lan Guest House and a couple of other lodgings, including the red brick bungalows ($30) in shady grounds at Ai Si Guesthouse (077 629 0510), a few minutes walk from the beach (you can also try their rượu sim – a liquor made from locally grown rose myrtle). 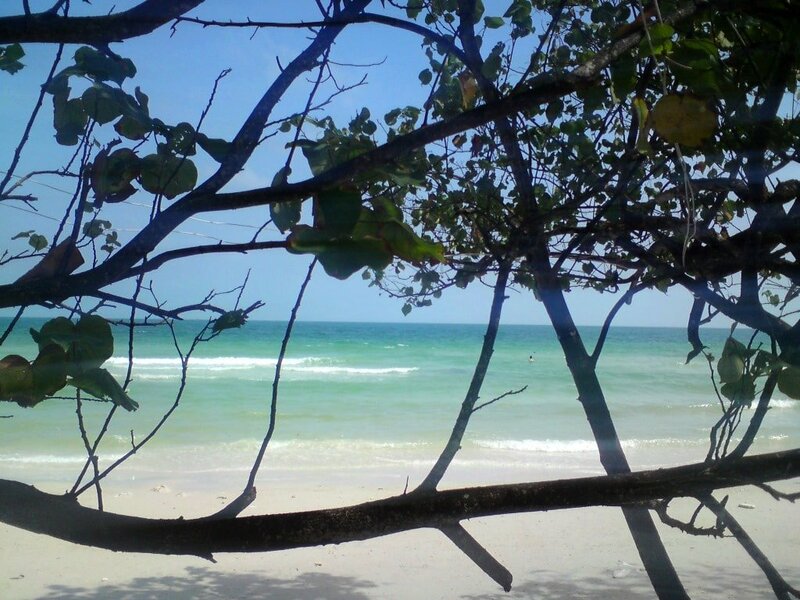 But my favourite way to experience Sao Beach is to ride up to Paradiso Beach Club, order a Gin & Tonic, sit out on the beach under the tall coconut palms, and take a sunset dip in the Gulf of Thailand. After Sao Beach, continue north on Road DT46. 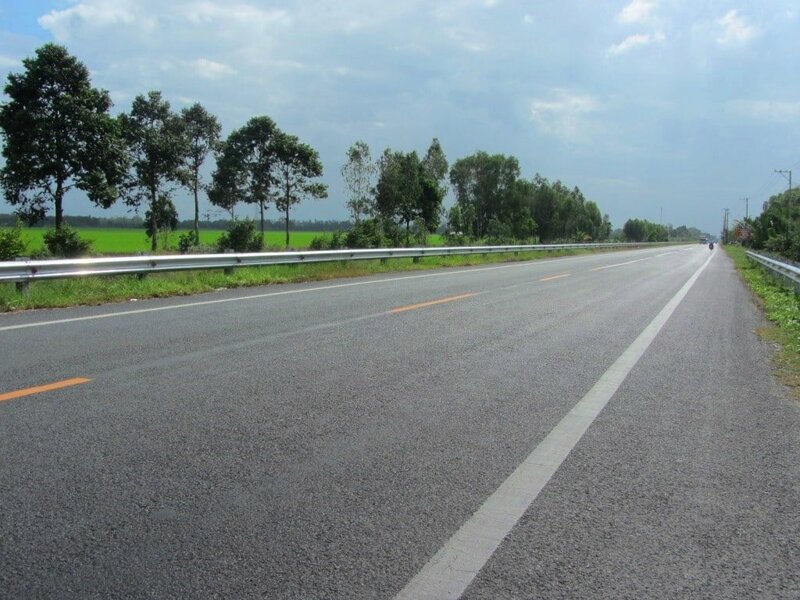 This is another of Phu Quoc’s newly laid, wide, smooth highways. You’ll notice that the air is fresher than on the mainland; scented with eucalyptus and cashew fruit trees. Look out for some very colourful, exotic-looking birds perched on power lines and pylons. However, cement trucks, plying to and from construction sites, regularly kick up clouds of dust. Bear left (due west) at the junction with DT47 back towards Duong Dong. Take a right at Duong Dong, heading due north on Road DT45, which leads through town, straight over the disused runway of the old airport (now known as Vo Van Kiet Street), and out the other side. This road, only a few years old, is already in need of widening thanks to increased traffic in recent years. 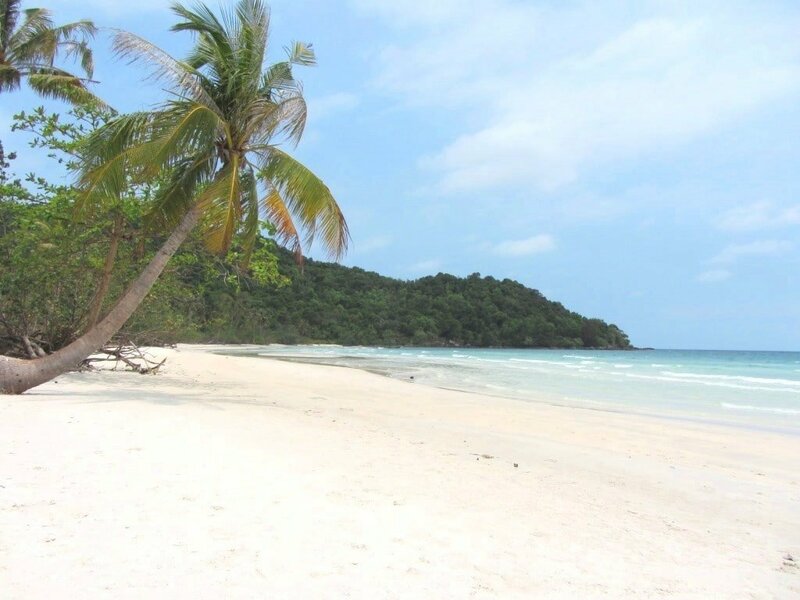 However, the lanes branching off DT45 to the left (due west) lead to Ong Lang Beach, one of the prettiest, most laid-back beaches on the island, including some of the most atmospheric places to stay. Look out for the signposts to specific resorts at the lane entrances. Even if you’re not staying on Ong Lang Beach, it’s a good idea to head down the lanes for a drink and a swim at some of the resorts’ beaches. In particular, Thuy House is a fantastic budget option with a friendly, communal vibe, and so too is Freedomland, but prices are now quite high. Bo Resort and Coco Palm Resort offer excellent mid-range value, while the lush, eco-friendly, and atmospheric Mango Bay is superb. For high-end beachfront luxury, The Shells, Sea Sense, and Chen Sea won’t disappoint. Several kilometres further north of Ong Lang Beach, Road DT45 crosses a river. Turn left after the bridge and follow the road as it winds through an interesting fishing village to a long sandbar, known as Cua Can Beach. Pathways lead from the village to the sandbar, but for a great view of the beach, continue on the road around the village, heading inland at first, then up a steep hill to Chez Carole Resort. Stop here for a drink with fabulous views back over Cua Can Beach. Heading along the coast from Chez Carole, the road quickly turns to red dirt. However, they are currently in the process of paving this route so expect unpredictable road conditions here for a while. Draped in dense tropical foliage, this beautiful dirt lane follows the curve of Vung Bau Beach, which is the last vestige of ‘old’ Phu Quoc on the west side of the island. A few years ago, it was possible to continue on this dirt road all the way to the island’s northwestern-most tip, passing miles of perfect, empty beaches, with blue seas lapping the exposed routes of casuarina trees. Now, however, the northern section has been developed into an enormous resort-entertainment complex called Vinpearl Land, including a water and safari park. But, the few kilometres between Chez Carole and the beginning of Vinpearl are still largely undeveloped, offering some of the loveliest beaches in all Vietnam. However, the bulldozers have already moved in on large sections of Vung Bau Beach, tearing their way through the rain forest to access the beachfront, and it’s now no longer possible to ride the dirt road uninterrupted from Chez Carole to Vinpearl. Instead, you can ride as far as a small river crossing from Chez Carole before hitting construction work. Then you must turn back to Chez Carole and rejoin Road DT45 until it passes behind the construction site, then turn left, following the signposts for Vung Bau, to rejoin the dirt road along the beach. 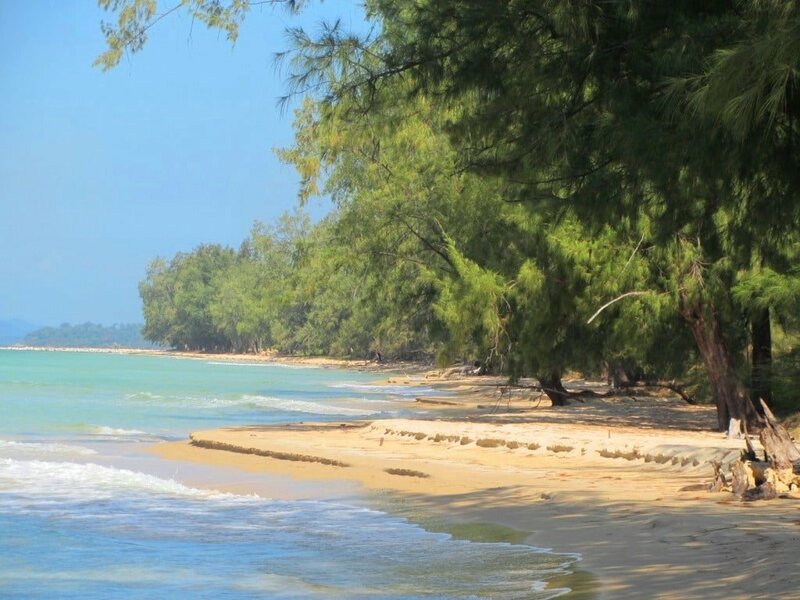 Wild Beach, Bamboo Cottages, Mai Phuong Resort, and Vung Bau Resort are all fabulous (and reasonably-priced) places to stay for a night or two, but one wonders how long it will be before this section of beach is lost to large-scale development too. 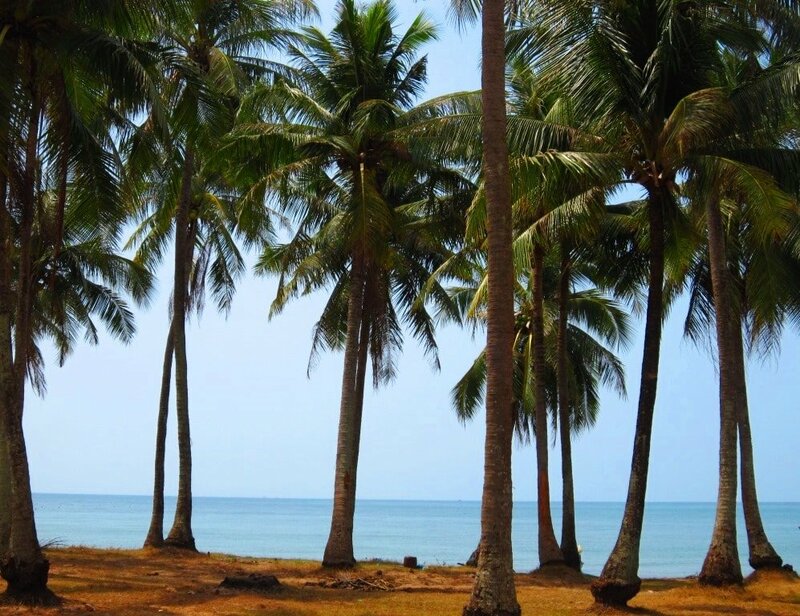 Vung Bau beach is the last vestige of ‘old’ Phu Quoc: it’s gorgeous, but how long will it last? After visiting Vung Bau Beach, continue on Road DT45 due north towards Ganh Dau. With the opening of the gigantic Vinpearl Land complex and the ongoing construction of yet more humongous projects, this stretch of road can be fairly busy with construction workers and trucks. If you’ve been visiting Phu Quoc for several years, this is a depressing ride: the litter, construction debris, destruction of the forests, and parceling off of all the beachfront to high-end development is all rather sad. Ganh Dau, at the tip of the island, is a surprisingly big and busy fishing town. Biên Hải Quán is a wonderfully-located seafood restaurant overlooking the fishing boats just before entering town, which makes a good lunch stop. Ganh Dau Market is worth a look and after this continue east along the beach on a small paved road (actually the continuation of Road DT45) leading to a couple of isolated resorts on a beautiful stretch of beach overlooking the Cambodian mainland. Peppercorn and Gold Coast resorts occupy a wild, white-sand beach shaded by leaning coconut palms. Peppercorn also serves excellent food, so stop by for a bite to eat and a swim. From Ganh Dau to Bai Thom, in the northeast of the island, there are two routes. Either head back down to Cua Can on Road DT45, and from here turn left (due east) on a good paved road until it meets the Duong Dong-Bai Thom Highway; or take the Suoi Cai-Ganh Dau dirt road east from Ganh Dau all the way to the same intersection with the Duong Dong-Bai Thom Highway. The former is faster because it’s all on paved roads, and it passes agricultural land, including pepper farms, for which Phu Quoc is famous. The latter is slower but prettier, because it passes through a dense canopy of tropical forest and also has access to remote Rach Vem Beach. However, bear in mind that, if it has been raining, conditions on this road can be muddy (but at my last visit the dirt road was in the process of being paved). Not far from where both roads meet the Duong Dong-Bai Thom Highway, Pepper Farm Bungalows is a cheap, atmospheric place to stay the night on a pepper farm. The Duong Dong-Bai Thom Highway is an excellent dual carriageway snaking through some of the island’s most impressive rain forest. Traffic is very light and the only sounds are your motorbike engine and the shrill and constant screaming of insects from the jungle. Before reaching the Bai Thom roundabout, a small, dirt road on the left (due west) eventually winds its way to Rach Tram, another isolated fishing village and beach (again, this dirt road is currently being paved, which will make access much easier). Bai Thom has a stark beauty about it. Although the beaches are hidden down tracks and the water’s very shallow and tidal, there’s something beguiling about this remote northern tip of Phu Quoc Island: it’s ripe for exploration. Silent, still, hot, sparsely populated, and filled with the scent of cashew fruit and the sound of midday cicadas, Bai Thom hasn’t seen the same development as the rest of the island. There’s not much here yet, but for a few food shacks and a couple of simple resorts. 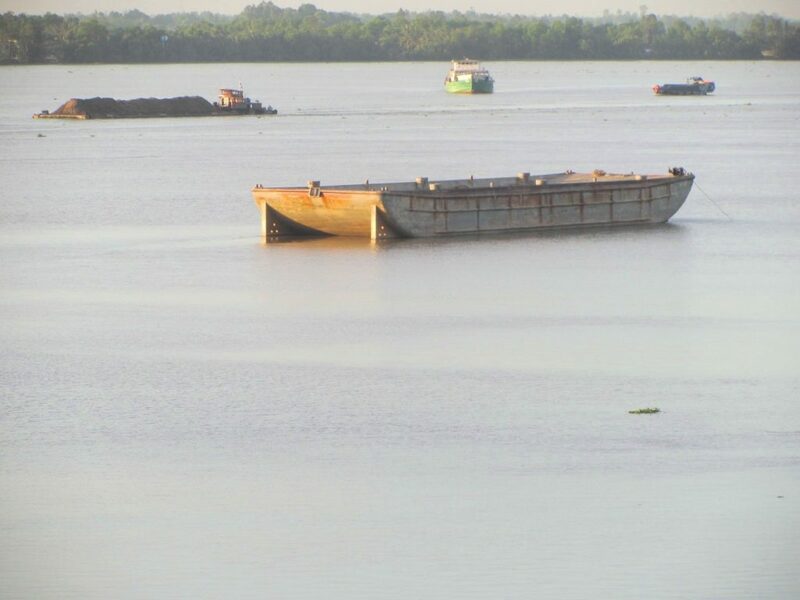 A few times each day the red dust on Bai Thom’s dirt road is disturbed by vehicles coming off the car ferry from the mainland, at Da Chong Port, 10 kilometres to the south. There are plans, of course, for sprawling resorts here, and the dirt road is currently being paved so, perhaps, it won’t be long before slumbering Bai Thom is awoken. Road TL48 heads south from Bai Thom all the way to Ham Ninh Village, from where you can continue to Bai Vong Port, making it possible to do a complete loop of the island. 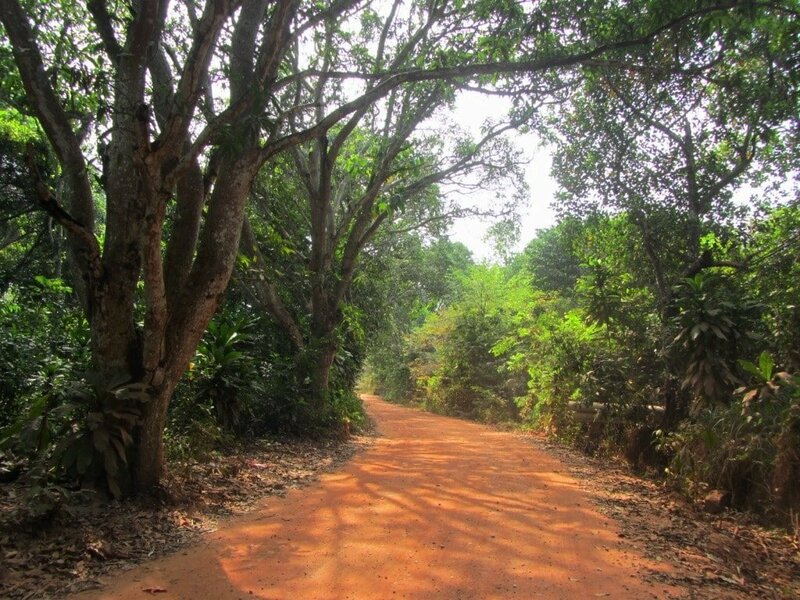 However, this is a long dirt road and should only be attempted in the dry season (November to April); for the rest of the year it gets very muddy and becomes almost impassable. Until this road is upgraded, the easiest option is to ride back to Duong Dong town via the Bai Thom Highway and continue south to Bai Vong Port on Road DT47. 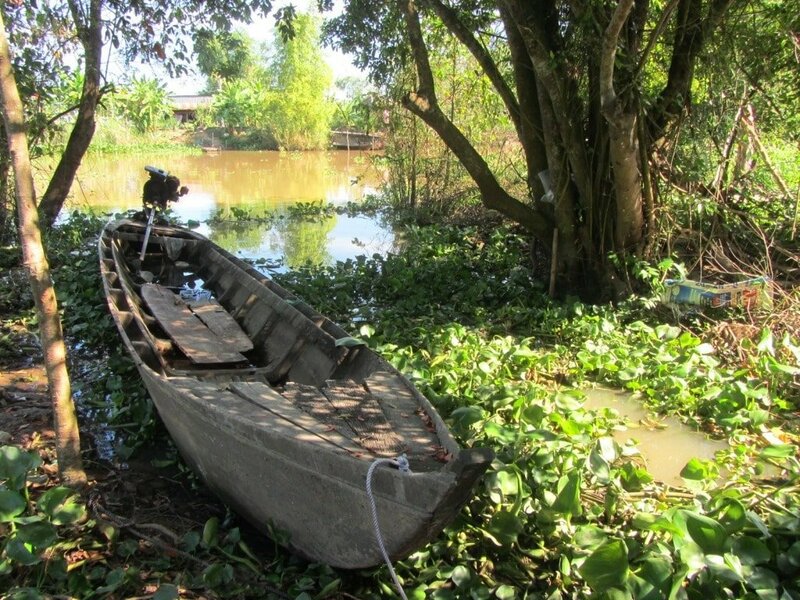 From Bai Vong, put your motorbike on one of the several daily fast boats to Rach Gia in the Mekong Delta. 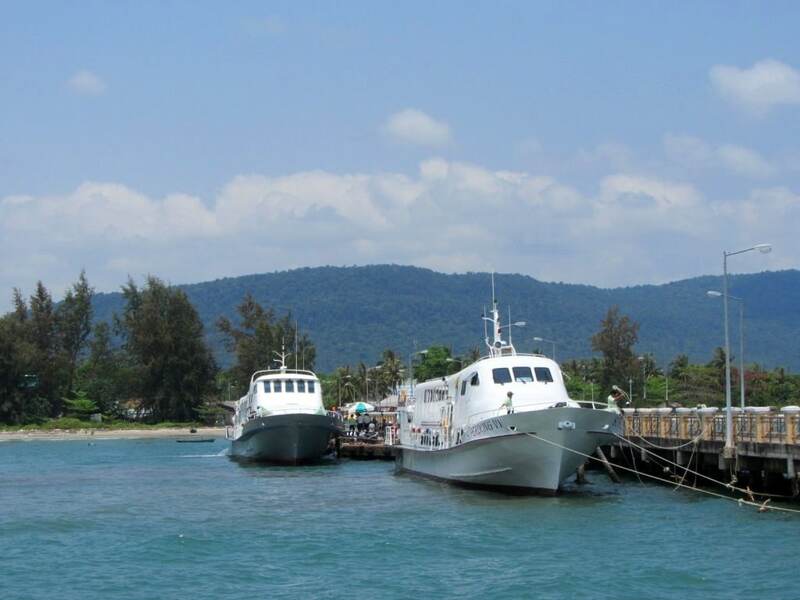 (For all the ferry information, fares, and schedules see my Phu Quoc Ferry Guide). 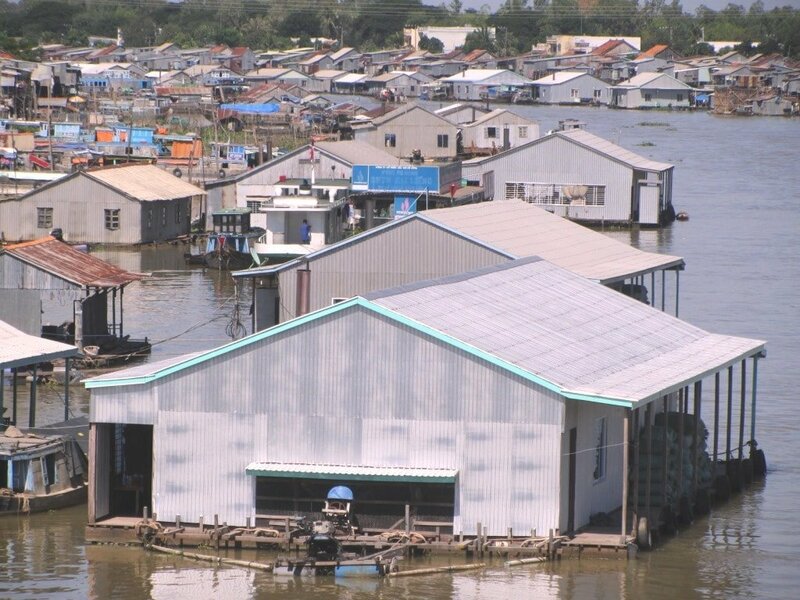 Rach Gia is a big, busy, and thriving Mekong Delta city. There’s a real buzz about this place, which might come as a shock after a few lazy days on Phu Quoc Island. New infrastructure, including a beach road along the Gulf of Thailand coast, big shopping malls, hotels, and bridges spanning canals and rivers, have transformed Rach Gia into a frenetic, relatively wealthy and cosmopolitan-feeling city. 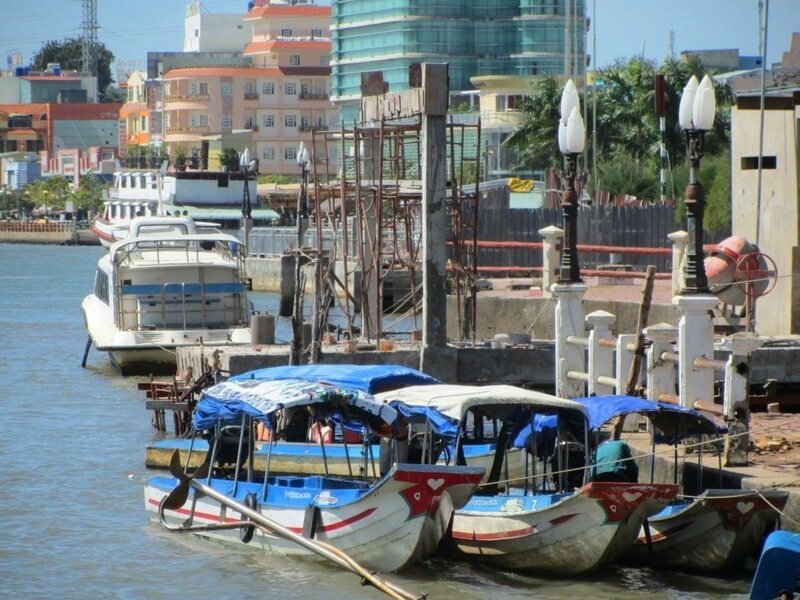 The fast boats from Phu Quoc dock at the ferry pier at the end of Nguyen Cong Tru Street. Ride off the ferry and into the controlled chaos of Rach Gia’s busy streets. There are plenty of cheap, bog-standard nhà nghỉ (guest houses) near the port on Nguyen Cong Tru Street. But I prefer to head a bit further into town to Kim Co Hotel for budget beds, or there are now several good-value mid-range places to stay near the new beach road: in particular, the river-view rooms at Hoa Binh Resort, including a good-sized swimming pool. There’s lots of street food around town (try the Chinese-style roast duck and pork stalls near the square) or you can head to the new oceanfront road and park for a whole string of smart cafes and BBQ seafood restaurants. Rach Gia’s backstreets are good for wandering: there’s a large Chinese population here and the smell of drying medicinal herbs scents the air; there are also a few interesting temples dotted around town. But the main roads are busy and polluted: it’s not a beautiful city. One of the first things you see after getting off the ferry is a replica of an old French ship called, L’Espérance. The vessel was blown up by Vietnamese nationalist hero, Nguyễn Trung Trực, in 1861. There’s a temple dedicated to him opposite the ship, and a large statue stands in the nearby square. He was eventually captured by the French colonial authorities in 1868 and executed at the age of 28, meeting his firing squad with a volley of patriotic words. Leave Rach Gia heading south along the wide, new, ocean boulevard, called Ton Duc Thang Street. After turning left (due east) onto Phan Thi Rang Street, the road passes through miles of brand new, generic housing. Bear right (due south) onto Nguyen Trung Truc Street, leading through the uninspiring town of Rach Soi before it turns into Highway QL61. This first half an hour is a long crawl through the busy, grimy Delta suburbs. This is when you realize how densely populated, urban, and industrial the Mekong Delta region can be. However, it’s not long before the urban sprawl morphs into rice fields and fruit trees, and the riding is good again. 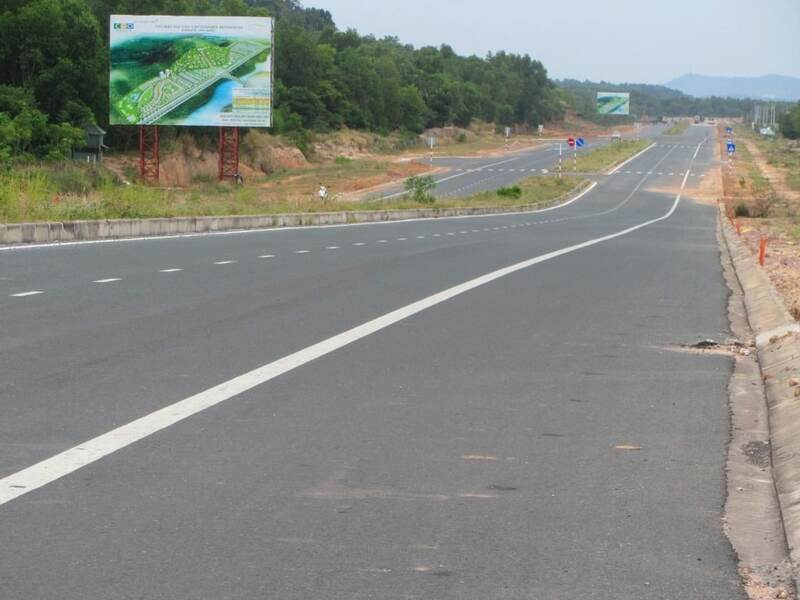 Look out for a few splendid-looking Khmer temples lining the newly laid, perfectly straight road towards Vi Thanh. Unfortunately, after taking a sharp left, Highway QL61 turns into a potholed gravel pit for several kilometres before reaching Vi Thanh. The latter is a decent place to break the journey with a coffee and snack along the canalside road, before rejoining the highway (now called QL61B) for the easy ride northeast through glowing rice fields to Can Tho. Traffic increases considerably as you approach Can Tho, the largest city in the Delta. Bypass the city completely by bearing right onto Highway QL1A and taking the bridge – an impressive engineering feat – over the Lower Mekong River. Continue on horrible Highway QL1A for a mercifully short ride to Vinh Long, where you can skirt around the edge of town using highways QL53 and QL57 to the Dinh Khao ferry crossing. On the other side of the river, Road QL57 continues east across what is essentially a large island in the Mekong River. It’s a short, lush and easy ride. After 15km turn left (due north) on Road DT883 to yet another ferry crossing. The Tan Phu ferry rejoins Road DT883 on the other side of the river, leading eastwards through a beautiful, green landscape of fruit orchards. 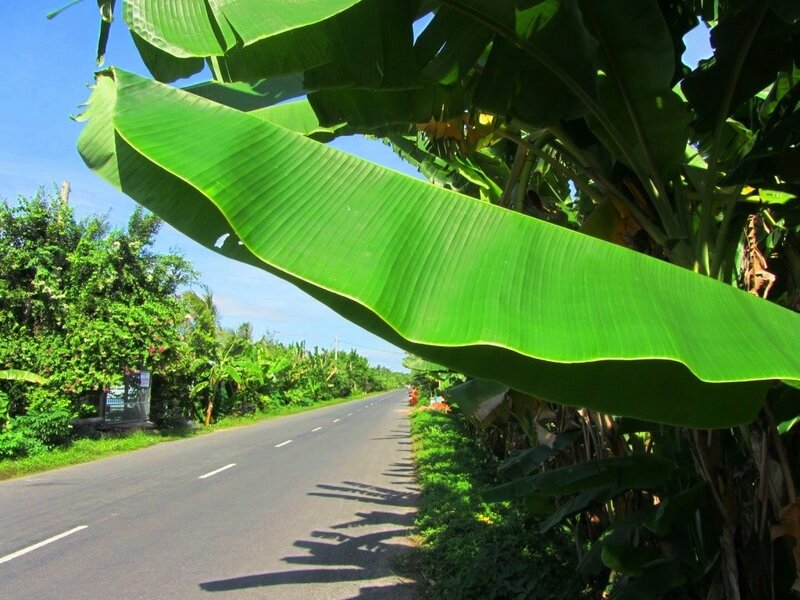 The air smells of ripe fruits and the road is lined with banana plants. It’s an attractive area and the last stand of really nice countryside before the long crawl back to Saigon. If you want to make your road trip last a little bit longer, consider staying at the Forever Green Resort on this road, for one last night of comfort and greenery in the Delta. Road DT883 eventually hits Highway QL60. Turn left (due north) and cross the Mekong River, for the last time, via the Rach Mieu Bridge. Turn right (due east) immediately after the bridge and take Road DT864 through the busy city of My Tho. 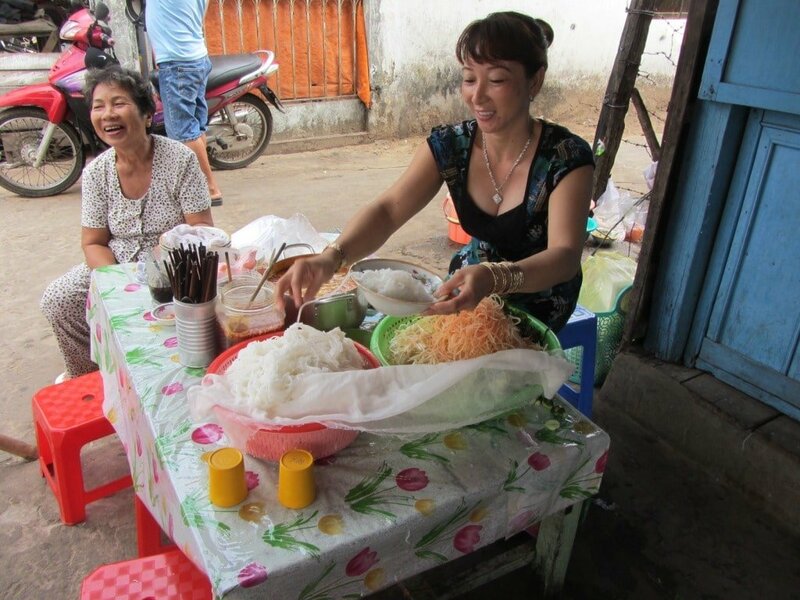 If you’re hungry, look out for signs saying ‘hủ tiếu Mỹ Tho’, a noodle soup that this town is famous for. If you’re tired and want to leave the last leg to Saigon until the next morning, the Song Tien Annex Hotel is a decent budget option. My Tho’s riverfront has some appeal, but compared to the river towns you’ve already seen on this road trip it’s not that interesting. Cross the bridge on Dinh Bo Linh Street going east out of town, until the road becomes Highway QL50 towards Go Cong. This is the ‘back route’ from My Tho to Saigon. The point in taking this road is that it bypasses Highway QL1A, which is a more direct but busier and dustier (and more depressing) way to enter the city. Highway QL50 east to Go Cong is in excellent shape. From here the highway turns north, towards the My Loi Bridge over the Vam Co Dong River. At the top of the bridge (yet another impressive piece of new infrastructure), take one last look at the lush, watery landscape that you’ve become accustomed to on this road trip. 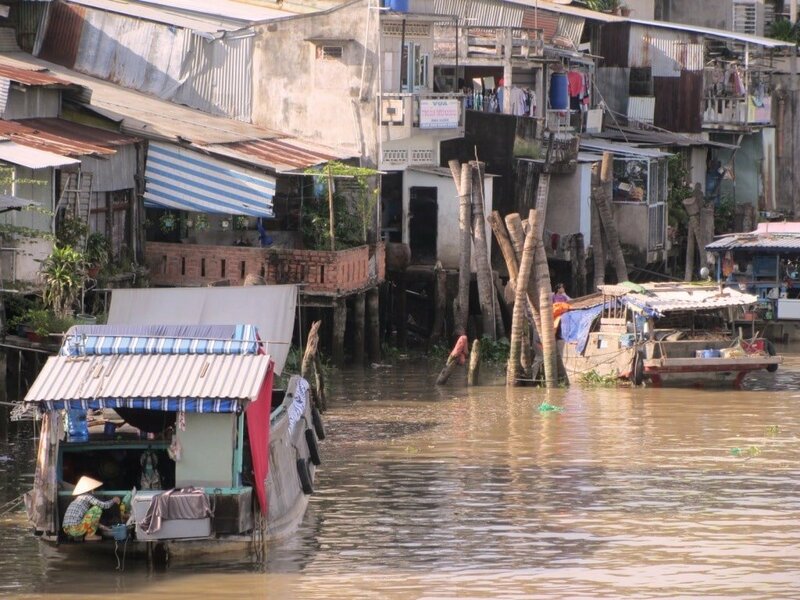 Once on the other side of the river it’s a slow and steady decline to Saigon. Trucks, dust, traffic, pollution, and noise all get worse as you get closer to the city: the last 10km, when the road narrows creating a bottleneck, are pretty terrible. Grit your teeth and continue north across the Nguyen Van Linh ring road, following QL50 until it ends at the Vo Van Kiet Expressway, which is where you started. 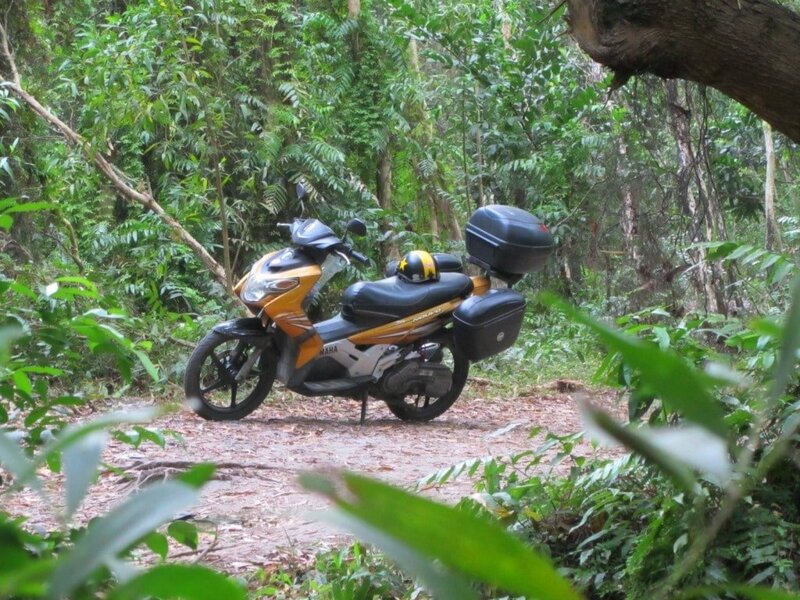 This entry was posted in ALL, Coastal, Mekong Delta Motorbike Routes, MOTORBIKE GUIDES, The South and tagged ferry, guide, ha tien, Ho Chi Minh City, motorbike, Phu Quoc, rach gia, road trip, Saigon, Vietnam. Bookmark the permalink. – I’m used to drive motorbikes in Thailand, but never drove in Vietnam before : do you think it could be this dangerous? This route takes different, quieter roads than the ones that the buses take. However, there are some busy sections: specifically the first hour or two out/in to Saigon in both directions. Also, the first 30min-1 hour out of Rach Gia, and the section of Highway 1 between Can Tho and Vinh Long. Just try not to hit these sections during the rush hours (6-9am and 4-7pm). The rest of the loop is relatively quiet. Also there are hundreds of smaller, paved back-roads criss-crossing the Mekong Delta that yo can take if you have time. Riding in Thailand will prepare you for the roads in Vietnam, but of course you still need to be extremely careful. Hey Tom! Not sure if you remember me or not ; ) Was researching taking a scooter from Ho Chi Minh to Phu Quoc, and stumbled upon this. Was surprised when I saw your pic/name! I’ll be visiting Vietnam this December from Japan (it’s been almost 5 years!) Definitely looking forward to it. Good post btw. Hope all is well on your end! Good to hear from you. I hope you’re enjoying Japan – I guess you must be! Great that you’re coming back to Vietnam for a visit – this is a nice ride in December if you’re planning on doing it. This route does take road QLN1 from Chau Doc to Ha Tien. It doesn’t take road N1 from Chau Doc to QLN1 because parts of the N1 road were bumpy at the time of research. We’re a group of international students, who are doing it starting on monday (2 days from now). Good to hear you are excited about this road trip. This guide was fully updated quite recently, so there’s nothing new to add as far as I know. Just remember to take care and expect quite heavy traffic and dust for the first hour from Saigon – unless you leave super early in the morning, of course, as suggested in this guide. Brilliant, fantastic article and great website. Can you recommend any good rental companies in HCM that won’t be too fussed about renting it out for a week and for a reasonable price? I’d be happy with a semi-automatic honda wave. And what’s the situation with police stopping you for fines? Any spots on the way to watch out for? they seem to be much more on it than in the North. For bike rental in Saigon try Tigit Motorbikes and Flamingo Travel. They should also be able to give you some more advice about police. Personally, I’ve never noticed any particular hotspots for police on this route, but of course there’s always the chance. Normally, you will get away with a standard ‘fine’ of about $10-$20. Thanks alot for the info, I’m looking forward to it! Hah, I’m in Buddy’s right now, we’re halfway along your route on our Wins. Andy at Oasis tried to talk us out of taking the ferry to Rach Gia, reckons the deckhands will shake you down for more money to unload your bike. We took the car ferry over. Any thoughts? They sometimes charge you about a dollar for a handling fee but that’s all in my personal experience of taking the fast boat. It shouldn’t really be a problem, but you’ll need to book your passenger and bike tickets for the fast boat in advance because it’s much more popular than the car ferry. Thanks for the updates. Sorry to hear you had a bad time at Mai Phuong. Thinking about doing the trip to Phu Quoc tomorrow,(24.1.17), leaving at about 4am. Any idea what the traffic will be like once I have cleared HCM? Great website by the way. It should be OK at the moment, because the Tet holidays haven’t started for most people yet. I’m on the road now too and the traffic hasn’t been too bad. But there will still be a fair bit of traffic because of all the people who live in Saigon travelling back to their hometowns in the Mekong Delta for the Lunar New Year. Chhers for the info Tom. Definately going to head off at 4am. Where are you going to? I’m going in the opposite direction. Heading north to the Central Highlands around Kon Tum. I enjoyed this post having just done the trip with my wife over Christmas – based on a previous post of yours. We thoroughly enjoyed it and would recommend it to everyone. 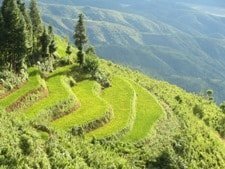 I also just wanted to say thanks for many of your posts that we’ve used and which have enhanced our life here in Saigon – including the Far North Circuit from Ha Giang, the feature on Saigon’s swimming pools, places to stay along the coast, and especially the one’s about food – Com Ta M, Chicken Corner etc. Thanks. I’m happy to hear you’ve enjoyed your trips and food, and that my guides have helped you along the way. 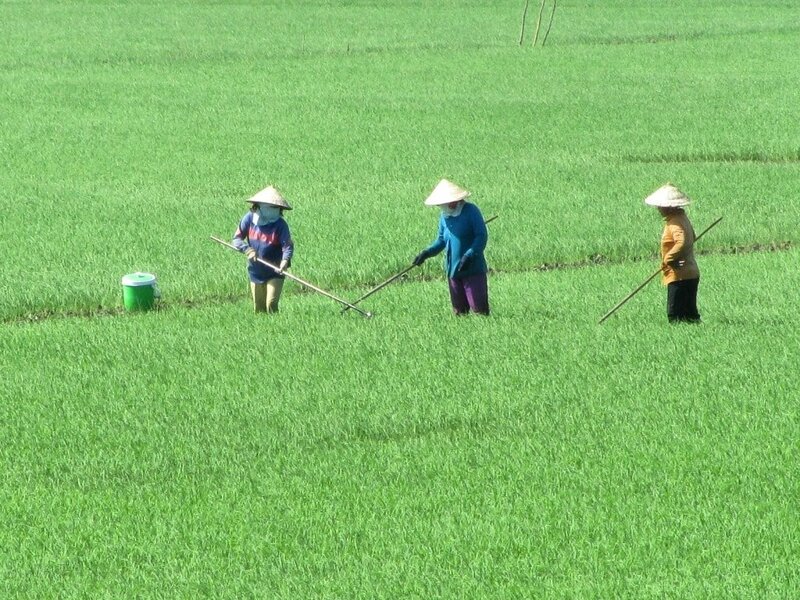 It sounds like you’ve made the most of your time in Vietnam – lots of trips! I hope you have many more good experiences here. Hi thats a great blog! Was published in April2014 and with the development things change fast. Which of the beaches with mid range accommodation do you think is least developed these days? 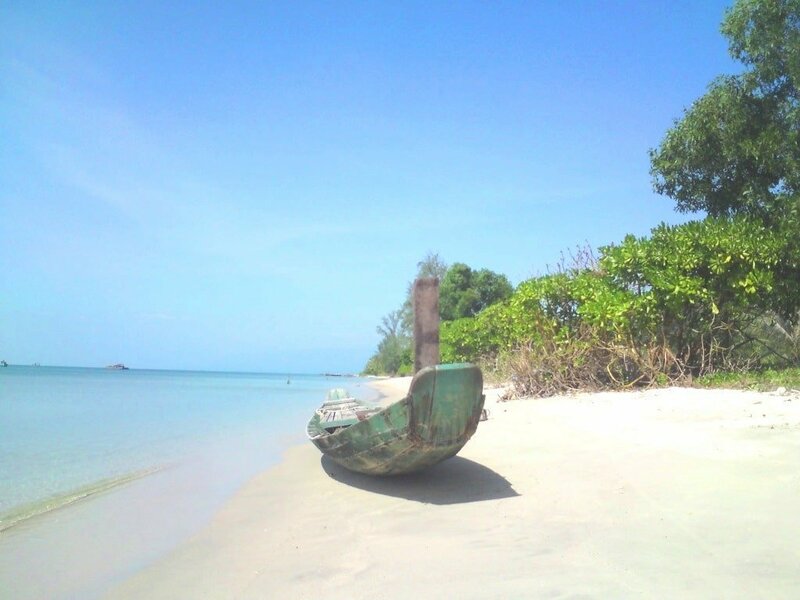 Take a look at my Guide to Phu Quoc’s Beaches. 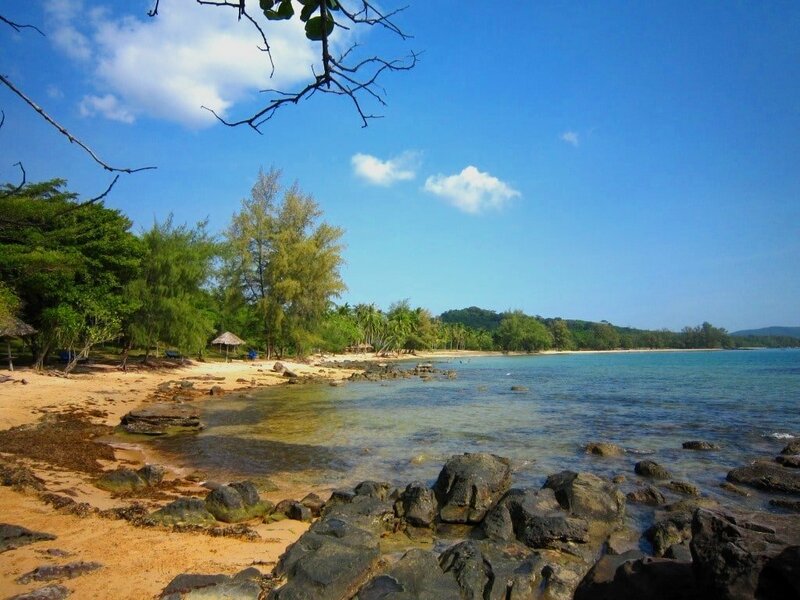 I would recommend Ong Lang Beach for good, quiet, mid-range accommodation. Somewhere like Mango Bay Resort for example. Just want to offer my sincere gratitude for this post (and your blog in general). What a great resource for those of us that love being on the road. I took an overnight sleeper bus from Ho Chi Minh to Ha Tien, and spent a day biking around Ha Tien (Moso Cave, Chua Hang Pagoda Cave for the first half of the day and to Mui Nai Beach for a very relaxing ocean-side second half). I got a Ha Tien biking map from Mr. Trinh Ngoc The (or simply Mr. Tay 0918574780) at the Oasis Bar in Ha Tien and rented a motorbike from him as well. Maybe this will help some of your readers. I biked pretty much all of Phu Quoc as you wrote, I particularly enjoyed the silent drive through the foreset to Bai Thom. The concrete road now goes all the way to a roundabout where there is a small dirt path to the beach. Unfortunately most of Bãi Dài is now cordoned off for the new resort being built there (I couldn’t sneak around the guard there! ), but the dirt path from Cua Can to Bai Dai was still pretty sensational. Thanks! 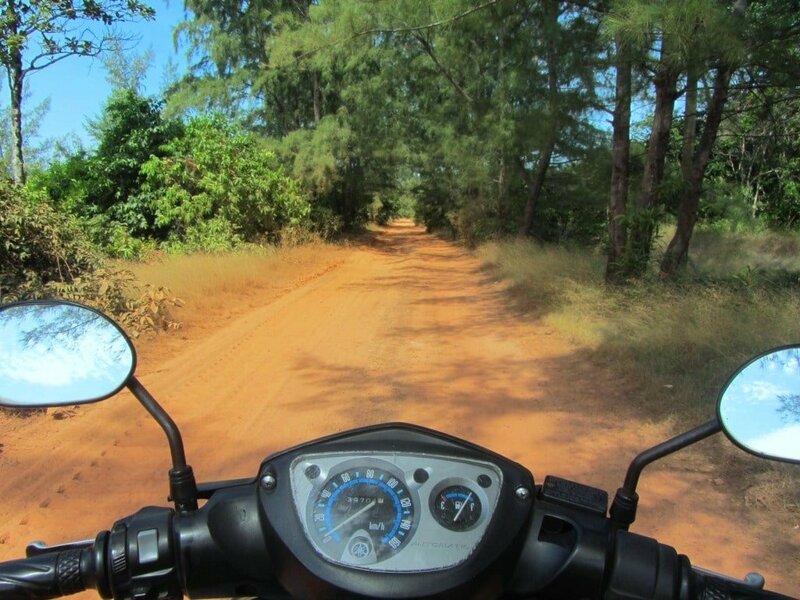 It’s great to hear that you enjoyed riding around Ha Tien and Phu Quoc. Yes, it’s a shame about Dai Beach – I’ve been meaning to update this guide for some time now. 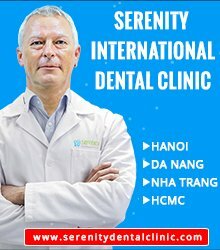 Thanks for the information about Ha Tien. I’d like to spend a lot more time exploring that area – definitely my favourite part of the Mekong Delta, along with the mountains just north of there. Glad you had a good time. Safe travels. Just wanted to let you know the crossing at the Ha Tien border (Prek Chak) was no dramas at all. Excellent! That’s very good to know. Thanks. Hi there, loved your blog. I was just wondering how much approximately you used in fuel for the one way journey? How much fuel you use will depend on what kind of bike you are using. As an example, my motorbike is a Yamaha Nouvo, it has a 4 litre tank which lasts for 150-200km. 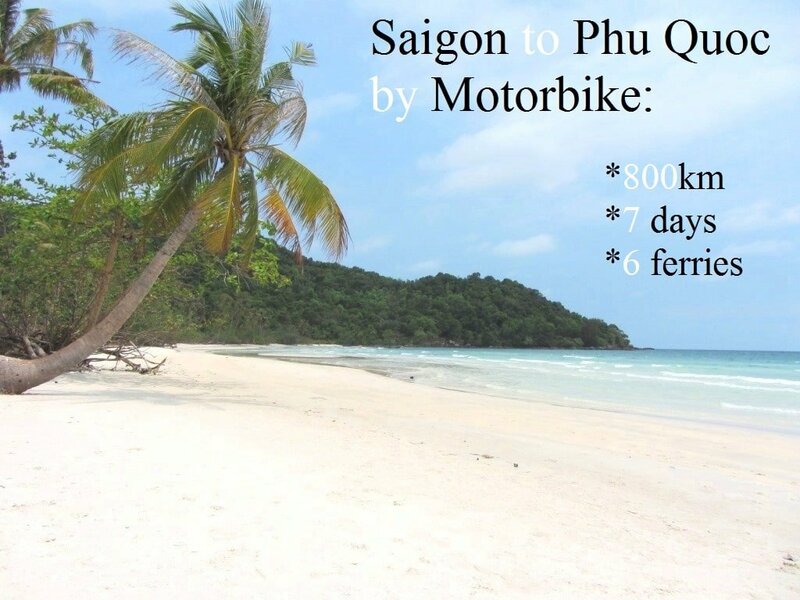 Ive decided to catch the ferry from Rach Gia to Phu Qouc then head to Ha Tien with the hope of getting my bike into Cambodia.. Any tips on the crossing? favourable border crossings, times ect? I’m afraid I’ve never tried to take my bike across that border, but I know people who have and they said it was relatively painless – some waiting around and some bribes if/when needed – but it got the job done. Please let me know how it goes. Also you might want to post this question on the Vietnam Back-Roads Facebook page to get a better answer. Cool video. I am heading over and plan to do the same trip. How many days do you think you should plan for a comfortable trip. I was planning on 8 days. Yes, 8 days is plenty. Roughly 2 days and 1 night to get to Phu Quoc, a few nights on the island and then 2 days and 1 night to get back to Saigon. So 8 days should be comfortable. I’m wondering if it is possible to rent a bike for a one way trip and fly? I’m pretty sure that on this particular route (Saigon to Phu Quoc) it’ll be difficult to find a bike rental company that’ll agree to a one-way rental. 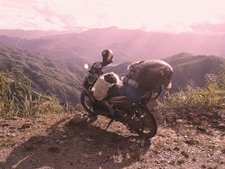 However, it’s worth asking: try Rent a Bike Vietnam or Tigit Motorbikes (both have links in the sidebar and bottom of this page) or Flamingo Travel. I will be doing the same soon and wanted to ask if you leave youre things with your bike, for example while going to the beach or sightseeing, or do you take them with you? Im traveling with a big backpack so I dont really want to carry it around all the time..
Hey Tom! We are in Tri Ton now and we’re staying the night. It’s a lovely town with an amazing street food street right in front of the Khmer temple. One thing we thought we’d add to your guide is that the guesthouses here have the words Nha Tro (which means motel) written in front, instead of Nha Nghi. It was quite hard for us to find a decent one, but we checked out around 5 and eventually found one good place on Tran Hung Dao, Nha Tro Thuy Vy (076.3773366). It was 6USD a night or 130,000 VND and half a kilometer from the main temple. 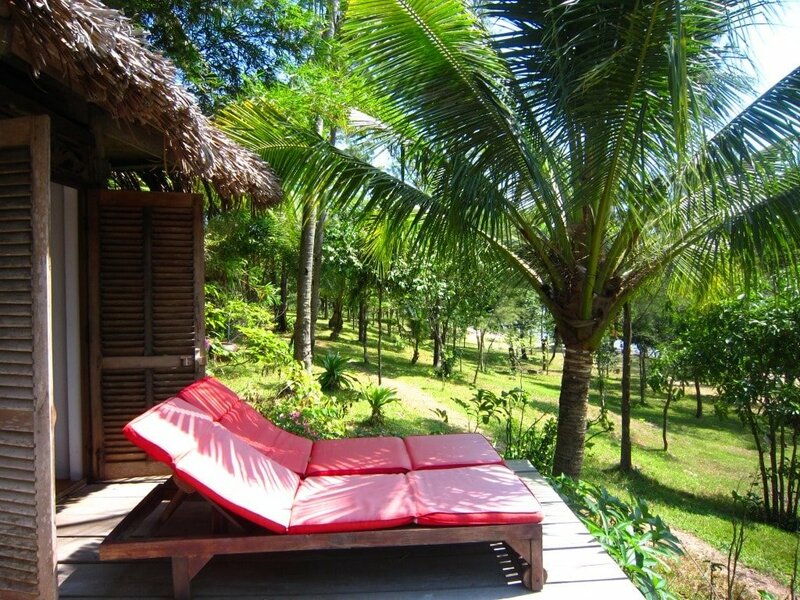 Looking forward to being in Phu Quoc tomorrow! 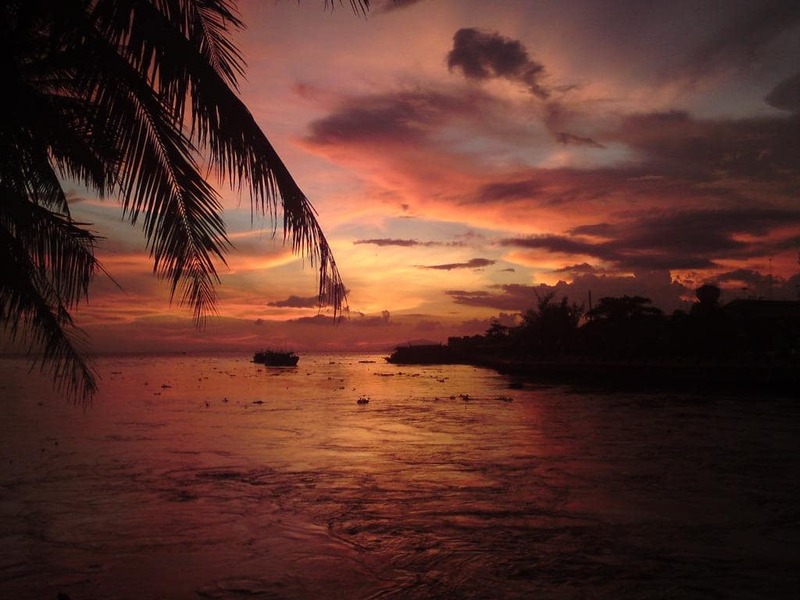 I hope your journey to Phu Quoc goes smoothly – let me know how the rest of your trip goes. I found a route that gets you to Ha Tienn mostly on back roads near the Cambodian border. It follows scenic canals the whole way. There’s no way to avoid the terrible drive to Mỹ Tho. From there, instead of heading to Sa Dec, head to Cao Lãnh via the small road 846. Towns and roads aren’t labeled in Google Maps, but they are in Google Earth. From there take two ferries to get to Long Xuyên. Heading to Tri Tôn gets you to a small mountain, which the road goes around. The road is good, and you can go fast, but it is quite scenic. Continue to Ba Chúc, which gets you to a small road on the border. Again, the road is good and scenic. Besides a few busses, no traffic. Follow the border to Ha Tien. It was a nice two day ride. Thanks for the info. Yes, I’ve taken the back-road route from My Tho to Cao Lanh and on to Long Xuyen and Tri Ton before. I like it. But in the rainy season the small road 846 can sometimes flood. I took the border road from Ba Chuc to Ha Tien once, a few years ago, but it was full on potholes so I haven’t done it since. It’s great to know that it’s now in good condition! I’ll definitely try it next time. If you’d like to try a different route to My Tho from Saigon (other than Highway 1), take a look at the return leg of this guide. I saw that there is malaria in Phu Quoc. Did you take any pills? 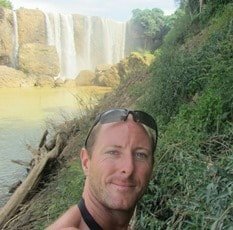 What would your advice be for malaria precautions in whole Vietnam? No I’ve never taken malaria tablets on Phu Quoc Island, and I’ve never met anyone who has. I don’t take malaria tablets anywhere in Vietnam, but many people do when they visit certain areas in the north of the country. I’ll be in HCMC next week and would love to go here and to Pac Bo cave. For someone like me without a bike or car is it relatively easy to get to by bus or taxi? Phu Quoc is very easy to get to, either by bus (and then boat) from Ho Chi Minh City or by plane. Pac Bo Cave is a bit more difficult. You can get a bus from Hanoi to Cao Bang City very easily. But from Cao Bang to Pac Bo Cave you’ll either have to take a local bus or arrange private transportation from your hotel – either a taxi or a car and driver.